It's an unmissable stop on any tour of the South African city. 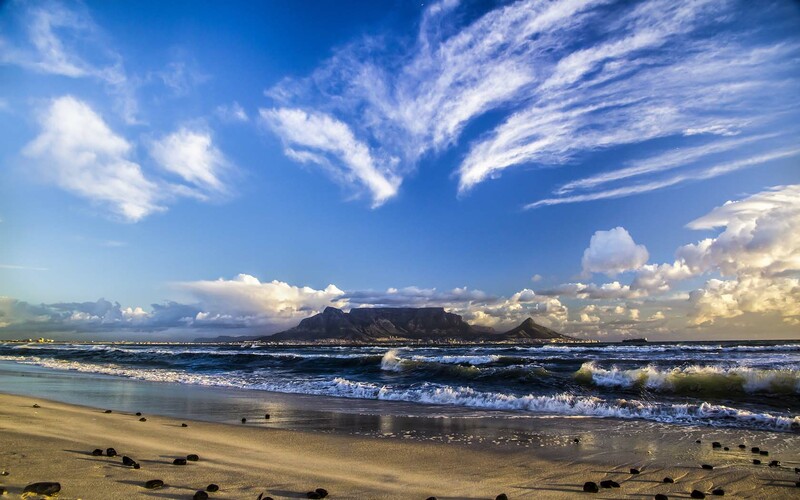 Looming over Cape Town from every angle, flat-topped Table Mountain is an unmissable stop on any tour of the South African city. From why you don’t need to jostle for a forward-facing view on the cableway to when to head up (and down) the mountain, here’s everything you need to know about visiting. If the weather looks even half way decent, don’t put off your visit for another time. 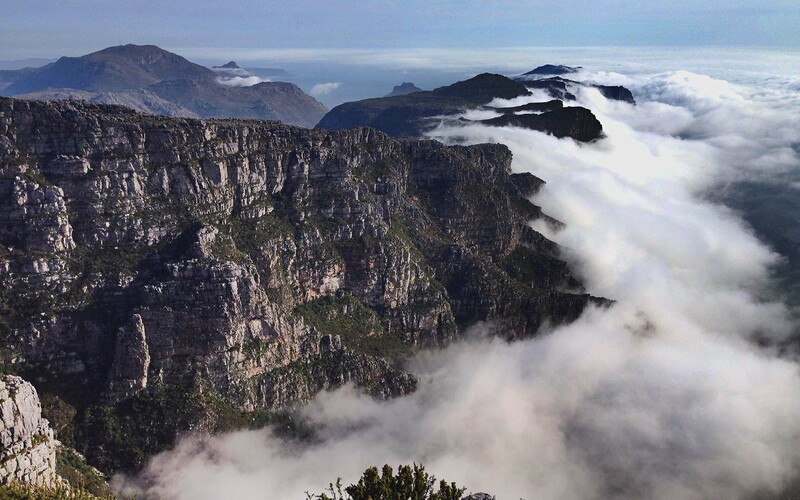 Table Mountain is often shrouded in clouds (with one particular formation dubbed “The Tablecloth”) and the cableway doesn’t operate in high winds, thick cloud and mist, or heavy rain. It’s best to get going while the going is good. Buy tickets online before you arrive so your only wait will be for the cableway, not the ticket booth as well. A morning ticket is valid between 8am and 1pm, but you can stay as long as you like once you’ve reached the top. Save your legs and take the free MyCiTi shuttle service from the Lower Tafelberg Road stop, just off Kloof Nek Road, to the Upper Tafelberg Road stop at the Lower Cable station. If you’ve hired a car, parking can be tricky in peak season. It can be easier to park near Lower Tafelberg Road and take the MyCiTi shuttle instead of trying to find a closer carpark. Your mum’s most consistent piece of advice is applicable here: It can get cold on the mountain, even when the weather is toasty in town, so wear layers and bring a jacket (even in summer). It goes without saying that you should also bring water, sunscreen and a hat. Everyone will try, but there’s no need to elbow your way into a forward-facing spot because the cable car floor slowly rotates so everyone gets to enjoy the view. If you’re afraid of heights, you should definitely stand in the middle of the round cabin as it’s a long way up (and back down). It’s also worth noting that there are no windows, so your pics won’t get spoiled by grubby or scratched glass. Table Mountain’s incredible outlook was made for Instagram, but a low battery could mean you’ll miss your shot, literally. Fortunately, you can charge your mobile devices at the free Wi-Fi Lounge on top of the mountain. The cableway operates for an extended period during summer, offering the best viewing conditions – later sunsets allow more time for getting up and down the mountain during the day. Even better, tickets are half price from 6pm in summer. One of the biggest you could make on Table Mountain is sticking to the viewing platform near the cableway. 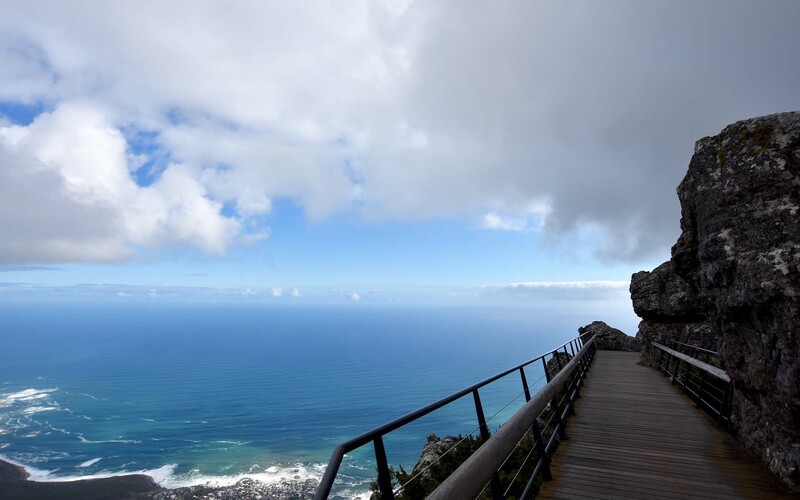 There are three clearly marked paths that will take you all the way around the top of the mountain for stunning 360-degree views of Cape Town, Table Bay, and the rest of the Table Mountain National Park. While the 3km hike to the top of Table Mountain sounds short, it is a steep and physically demanding route that shouldn’t be tackled solo. Abseil Africa offer guided Table Mountain hikes as well as abseiling trips. If you really want to get your heart racing, you can do a tour combining the two. You might need a clean pair of underpants after jumping off the mountain at 1000m above sea level, but the views make it all worthwhile. You may have to line up for more than an hour to catch a cable car back down the mountain, particularly if it’s an especially beautiful day or you are visiting during peak season. Allow plenty of time for the return trip, especially if you have booked a tour that leaves from downtown Cape Town on the same day you’re visiting Table Mountain. Check out Qantas flights to book your next adventure in Cape Town.